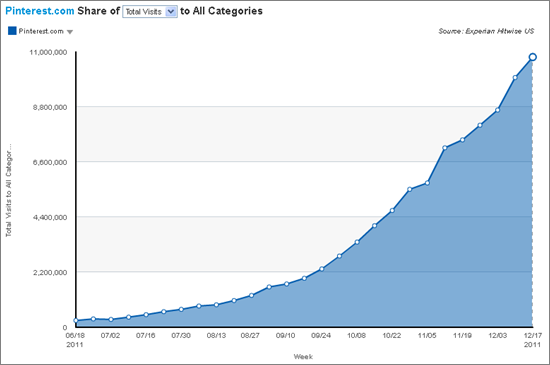 Home, style and DIY bookmarking site Pinterest has one fabulous growth curve. U.S. traffic to Pinterest is up 40 percent over the last six months, according to a new report from Hitwise. The site got 11 million visits last week, and is now one of the Top 10 social networking and forum sites. As compared to other social networking sites, Pinterest’s users are more frequently from the Northwest and the Southeast, with strong presences in states that seem to have large hobby-and-crafting populations, Hitwise said. That’s all very logical, but it makes the growth no less impressive. Pinterest also shares the wealth, since its pins are linked to content sources, which are often e-commerce sites. Sites like Etsy and Nordstrom say Pinterest is a significant and growing traffic referrer. Pinterest closed $27 million in funding led by Andreessen Horowitz in October, in a round that many other VCs would have liked to pin down.